Unbreakable came along for me just in the nick of time. I was in the mood for (and craving) a fun, spooky, fast-paced ghost story and Unbreakable was just the thing! I haven't read a ghost story that I have enjoyed this much since Anna Dressed in Blood. As a longtime fan of Kami Garcia via the Beautiful Creatures series (which she co-authored with Margaret Stohl,) I was highly anticipating both of their solo projects (Stohl published Icons this year.) Well, the charm and creepiness that Garcia helped bring into play with witches is now even more effective when applied to ghosts. So, Kennedy spends the novel (the first in an intended series, Legion) as somewhat of a fish out of water. The other members of the group all know each other and are comfortable with their talents. Kennedy is very unsure exactly where she fits in with her no-ghost-hunting-talented self. Naturally, there's a love-ish triangle. And, naturally, it involves twins. Which can be confusing at times, (for Kennedy and us) but I'm excited to see where this is all headed. Smooching aside, Unbreakable is chock-full of nasty, deadly, nefarious ghosts (exactly like I like them! You can keep Casper, give me Anna!). The gang comes up with many clever ways to defeat them while simultaneously trying to solve a puzzle and avenge the previous members of the Legion. Unbreakable ends with some loose ends that serve to make me want the sequel this very second, but doesn't end in a hari-kari inducing cliff-hanger that makes you throw the book across the room, and I must thank Kami Garcia for that because nothing makes me crazier! 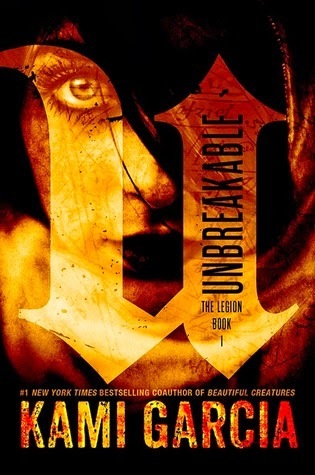 Unbreakable is the perfect fix for fans of: Beautiful Creatures, Anna Dressed in Blood, ghosts, demons, love-stories and twins. An excellent start to what is sure to be a blockbuster series! 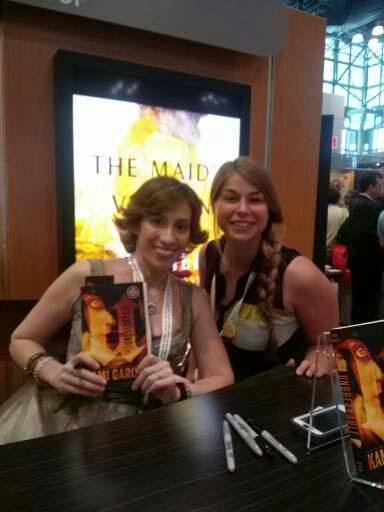 We were lucky enough to meet the ever-amazing Kami Garcia at Book Expo America this year! P.S. - She's amazing and friendly and was wearing the most amazing green dress that we are still coveting to this day! So, who's excited to get their hands on a signed ARC* of Unbreakable by Kami Garcia?! Actually, it just might be the very copy you see in this picture! Alrighty then, get to tweeting, Facebooking and general following and start racking those entries up! Don't forget to hit up the Freebie! Make sure to use the "Follow By E-mail" option to get the latest info in books and giveaways straight in your inbox! No I have not, (I don't think) I usually attribute it to my wild imagination or my pets or the creaky house, yet my mom claims to have seen a ghost watching over me and her when I was young, while she was doing normal things, such as doing laundry. I have had some creepy things though, like finding a hand print glowing on the window of my friend's front door, from the outside, still white. I love creepy things, though! HeHe. I once lived in a haunted house. Yes I was a trip, but at least the ghost was friendly. Just a joker. Haven't really seen one but I do believe they exist, come one many attribute the sounds and moved things to imagination but can't argue with the possibility of ghosts. My girlfriend and I lived in a house believed to be haunted. One night we were sitting in the living room and heard the front door open and closed, we thought it was my boyfriend but nobody came around the corner, when I go up to check there was no one there.